(3) Kali Mur 6X 1000 tablets #5 18% off SALE! (4) #6 Kali Phos 6X 500 tablets 10% off SALE! (5) Calcarea Sulphur 6X 1000 tablets 18% off Sale! 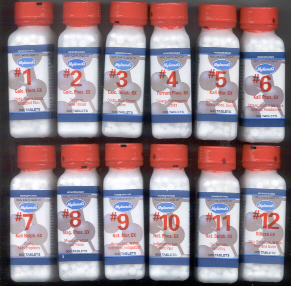 (17) Silicea #12 Silica 6X 1000 tablets 18% off SALE! (18) Natrum Sulphur #11 6X 500 tablets 10% off SALE! (19) Silicea #12 Silica 6X 500 tablets 10% off SALE! (20) Calcium Fluoride 6X 1000 tablets 18% off SALE!